I’m always surprised when I mention the TBA (Time Based Arts) Festival to friends only to find that it isn’t really on their radar screens. It’s a real shame as the ten day festival brings to Portland such a wide range of talent and is so well produced that it’ almost inconceivable that so many people aren’t even aware that it’s going on. 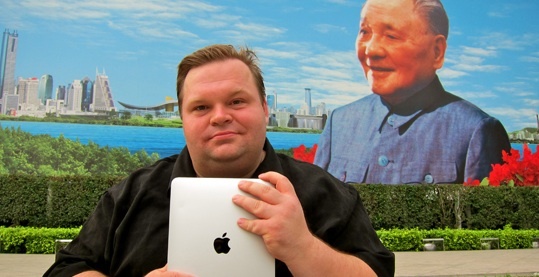 This year, the festival brings back Mike Daisey one of my favorite monologists with a piece dedicated to all things Apple (both good and bad) in “The Agony And The Ecstasy Of Steve Jobs. Daisey follows in the line of great monologists like Spaulding Grey and performs a style of of monologue called extemporaneous monologue, where he tells a story based on a loose outline of notes. His work has an unique mix of the almost electric buzz of complete improvisation combined with a strong wire framework of something totally scripted. Mike Daisey’s work often begins with the telling of some sort of personal journey and it’s combined with an examination of something bigger. Daisey mostly sticks to this format with The Agony and Ecstasy of Steve Jobs, where he details his trip to see the Foxconn factories in Shenzhen China (where the computers and related devices are manufactured) to witness the horrid working conditions of the Chinese workers. The telling of this journey is combined with the history of Apple Computers its unique relationship with Steve Jobs. In Daisey’s previous monologues this mix of styles comes off very well, but with The Agony and Ecstasy of Steve Jobs the mix is a little off. Last year at TBA, Daisey performed the monologue “If You See Something, Say Something” – a piece that dealt with homeland security. In that piece there wasn’t such a stated call to action or a push for the audience to make a change, but it left the audience with a real shift in perspective. With The Agony and Ecstasy of Steve Jobs, Daisey pushes for a much stronger route with his topic, literally asking the audience to do something about the issues at the end of the monologue. The humor of the piece also feels like it’s punched up a little harder to help balance out some more difficult parts of the piece including the details about horrible working conditions Chinese workers must endure to produce our tech gadgets. In many ways it feel like – “a spoon full of sugar helps the medicine go down”. The mix is an interesting one and it ends up giving the monologue an odd rhythm where one moment it feels almost like Jeff Garland doing stand up comedy and the next like a Michael Moore documentary. Having said all that, The Agony And The Ecstasy Of Steve Jobs is still a remarkably funny and interesting monologue. Daisey is a master storyteller who effortlessly connects with the audience. He has a magnificent ability to unify a group and create a shared experience – the real reason why there’s simply nothing like live theater. For fans of technology both Daisey’s confessions of his on Apple product fanaticism combined with the story of Apple computer are a real treat. I particularly loved Daisey’s take on Microsoft and Power point which were some of the funniest and most insightful views I’ve ever heard on the topic. But be warned these treats come with a very naked look at how these devices come into our lives and who the people are who sometimes are literally worked to death so we can have them. I applaud Daisey for trying new ways of dealing with his subject matter as I think too many artists are afraid of taking risks. But in this case I think Daisey has messed with perfection. His monologues inherently help shift the perspective of the audience and I don’t think he needs push any harder. When I left the theater a man walked up to Mike Daisey and shook his hand. Tonight’s pice was “an enjoyable ordeal,” he explained. I don’t think I could have put it better myself. Mike Daisey performs The Agony and Ecstasy of Steve Jobs, Sunday September 12 and Monday Sept 13 at 6:30pm at THE WORKS at Washington High School 531 SE 14th Ave. Tickets are $25. He also performs Notes Toward All Hours in The Day on Saturday September 18th at 2:30 at THE WORKS at Washington High School, 531 SE 14th Ave. Tickets are also $25. That monologue follow’s Daisey’s attempt at creating a 24 hour monologue. TBA:10 runs through September 19th. Ed note. It has since been revealed that parts of this monologue was a work of pure fiction which makes the activist nature of the piece all that more concerning. Daisy has clearly stained the very art from he’s been so instrumental in developing. Listen to This American Life: Retraction for great coverage on this issue and illustrations of the falsehoods in this monologue.